Orcs probably stink. Sometimes it might be best to keep your distance. 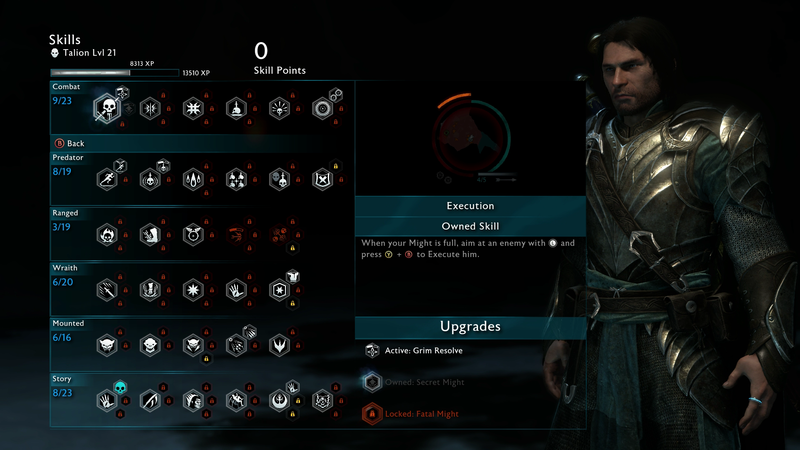 While Middle Earth: Shadow of War seems to be more focused on melee combat as a rule, with the combat skill tree being the largest in the game, the ranged skill tree for using your bow and arrow is actually on equal footing with the stealth predator skill tree in terms of size and utility. There are a lot of skills here, and you can change how you work with your bow significantly using them. In particular, you can make the bow more of a supplement to your other skills or you can make it more of a tentpole, major part of your strategy – and this is all dependent on how you spec and which skills you pick from this tree. Even if you’re not big on ranged attacks or not that good at aiming, some of these skills can be used as great ways to bolster your stealth or melee skills. Below, we explain. We’ve done melee and we’ve done stealth, and so that makes the next skill tree obvious – it’s all about that bow of yours and how you use it at range. These skills are all specifically built around this, though there’s some hidden gems in here even if you’re not big on ranged combat. You’re either going to love the bow or not, but there are a few things in this skill tree that absolutely nobody should sleep on. If the bow isn’t for you, hit up our Shadow of War skills guide to learn more about the combat and predator trees. 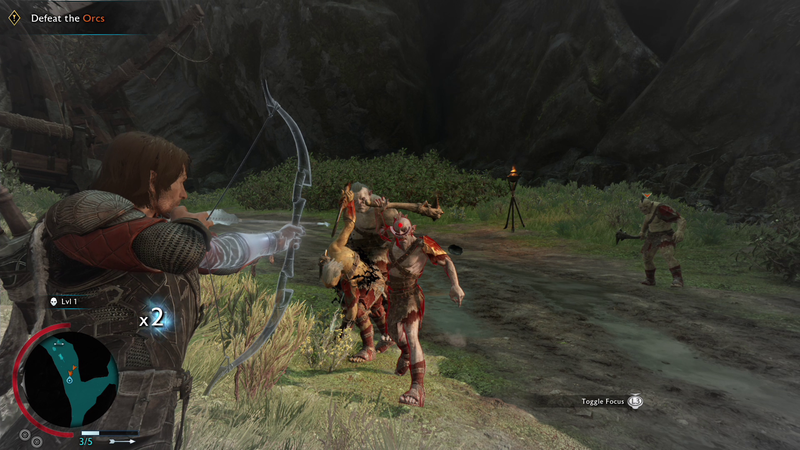 Shadow of War’s bow is pretty useful right from the word go thanks to the fact that hitting enemies with it in the head does some serious damage and thanks to the focus mechanic that slows down time to make aiming easier. Some of these skills are particularly great, however, and one or two stand out for even those players who want to be more melee-focused. Detonate is a must-have for everyone, as is its Bursting Arrows upgrade. The other beast-summoning upgrades are useful too – it allows you to cause havoc in enemy camps from a high perch without breaking a sweat, and is great for thinning the herd before getting stuck in hand-to-hand. Bird of Prey should also be a priority for everyone – it’s great for archers, but even people with a melee-focused Talion build can use the Talon Strike ability to make a flashy and damaging entrance to combat encounters with groups. It’s hard to understate just how useful Shadow Strike can become once you’ve upgraded it a bit – it can let you zip around an area picking off snipers before teleporting down to get involved in the fight with the bulk of the melee forces, or you can simply use it as another addition to Talion’s stealth repertoire. It’s brilliant for bow aficionados, but useful for just about any build. Its Shadow Dominate skill can be a game-changer for quickly regaining health. requires skill to use thanks to how you aim it, but it’s very useful for taking down enemies with shields or larger enemies once you grab the Savage Ice upgrade. This skill isn’t for everyone, though. Detonate is a ranged skill, but it’s one that will put you right in the enemy’s face when you’re done with it. Aim at a fire pit, and when holding R2 / RT press Square / X to teleport into it and detonate the fire bit like a grenade. It’ll set enemies on fire, which is very useful. Its upgrades make burning alive even worse for your enemies, if you can imagine that. Bursting Arrows: If you don’t want to end up in the thick of it, this upgrade will make it so you merely have to shoot fire pits, not teleport to them, to explode them. Spider Song: Okay, this is gross – the explosion will also cause a swarm of spiders that will attack and terrify enemies. Level 9, and being a monster, required for this one. Matron’s Scent: I’m really not sure if this is better or worse than the spiders, but it is similar – it causes ghuls to swarm the exploded fire pit. Level 13+. This one asks a question of you: How’s your aiming? Play many shooters? If you’re a good shot this is useful – shooting an enemy in the foot will freeze that foot to the floor, holding them in place. Savage Ice: Level 12 and up for this one – and it’s useful. It lets the Freeze Pin work on larger enemies like Olog-hai. Deep Freeze: You’ll need to be over level 17, but this doubles the duration of the freeze pin’s effect. Everything gets a bit Zelda: Breath of the Wild with this one (yeah, I know other games have this ability – but c’mon, it’s a huge part of that game) – you can pull out your bow in mid-air, slowing down time to pop off a sweet Legolas-style mid-air shot. It looks cool, too. One of the upgrades gives you a great new ability to kick off a melee encounter, too. Talon Strike: For level 15 and up, but this is a great skill: aim at the ground and then press attack (Square / X) in order to zip to the ground and strike it hard, damaging enemies below. It’s a great way to jump into a crowd of enemies and take them by surprise. Mighty Shot basically functions like a bomb arrow (again with the Zelda references, sorry…) – on impact with anything it explodes. You can shoot at the ground near a group of enemies to hit them all, or hit an enemy directly with an explosive shot. You do this by pressing R1 / RB instead of your regular fire button, but it consumes Might and your Might (built mostly through combat skills) must be full to do it. Firestorm: As well as the general explosion Mighty Shot now causes fire that sets enemies ablaze. Only for level 7 and up. Freeze Blast: With this level 18+ upgrade your explosion is now a frost explosion, with all the bonnus effects that brings. Venom: This is a high-end upgrade that requires level 25 and above, but it poisons enemeis caught in the Mighty Shot explosion as well. A natural evolution of the fire pit teleport of the detonation skill, Shadow Strike lets you warp to any enemy in bow range by simply targeting them and then pressing Square / X to zoom in to kill and Triangle / Y to zoom in to stun. Remember if you’re teleporting into a group of enemies to have your combat skills at the ready. Its upgrades augment this skill, giving you more options in its use. Chain of Shadows: As with some of the combat and stealth skill tree skills, this lets you chain Shadow Strike executions together at the cost of Focus Level 13+. Shadow Strike Pull: For level 21 and above, this lets you pull enemies to you rather than teleport to them by holding the button. Shadow Dominate: A great skill, but one tied to the Eltariel Sidequests. You’ll need to complete those first. This lets you press circle to instantly teleport to and dominate an enemy, ideal for interrogating worms then escaping quickly.